Best Minestrone Soup Recipe is one of those easy soups that you can put together in a snap. Use delicious vegetables from the farmer’s market or clean out your vegetable drawer and you will end up with a delicious and nutritious meal! Packed full of vegetables and beans this soup has less than 200 calories for a generous two cup serving. It’s filling enough for a complete meal! Minestrone Soup is a go-to easy meal. Full of delicious flavor, simple to put together and only gets better on day two! There’s a couple things I always include…zucchini, onions, carrots and celery. Those ingredients are kinda the basics of a good minestrone soup – don’t you agree? It’s full of delicious vegetables and it is a very filling meal. At only 200 calories per bowl, that sounds pretty perfect to me! What are the ingredients for minestrone soup? Most any vegetable is a good choice for this soup! Customize this soup with your favorite vegetables. Souper healthy ingredients – souper delicious meal! Grab your spoon to take a big bite of this soup – that’s one delicious spoonful here! 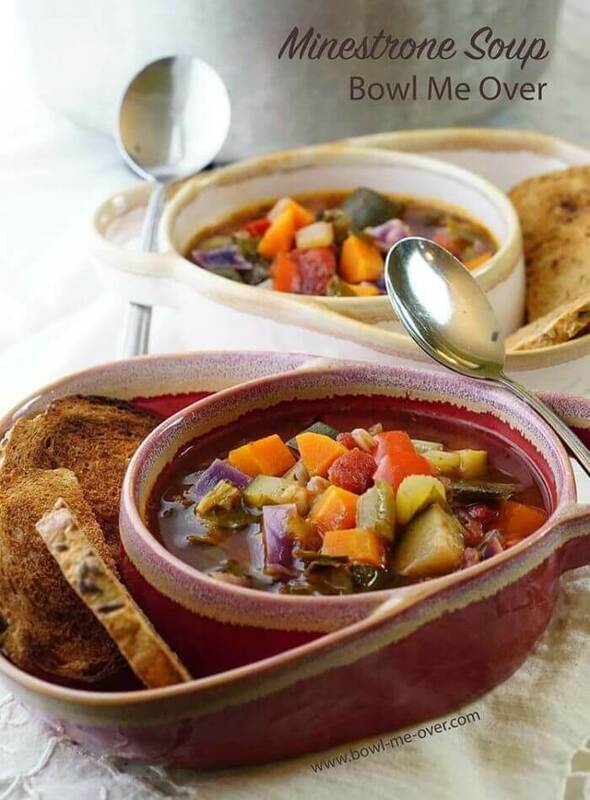 I love this recipe because it’s an easy and healthy minestrone soup. As it simmers on the stove it fills your entire home with the most enticing aroma! It takes minimal effort and on day two? It tastes even better! How do you make the best minestrone soup recipe? add the beans, garlic, kale and spices and continue sautéing for again for a couple more minutes. next add the stock, tomatoes, tomato sauce and 2 cups of water. bring to a boil and loosely cover. simmer on the stove for about an hour stirring occasionally. check and adjust seasoning – you may need a bit more salt & pepper. What spices are used in minestrone soup? Minestrone Soup was my one of my SIL’s Mitzi’s favorite meals and I would often serve it when she came to visit. Because the vegetables become soft and tender, some of my favorite sides to serve along with this soup is a hearty bread – focaccia or Italian bread are delicious! I’ve even served with my skillet cornbread, because who doesn’t love great cornbread? A bright crisp Caesar Salad also pairs nicely. A hearty chop salad is another great choice! And because this meal is light and guilt free if you’re looking to splurge at dessert why not stop by the store and pick up some cannoli? The crunchy cookie and inside packed with spiced sweet cream is the perfect end to this delicious meal! Who’s ready for a bowl of soup? Serve this up with toast points or crackers keeping this a light delicious meal! What kind of beans are used in minestrone soup? The beans mostly commonly used are cannelloni, navy bean or kidney beans. Oh and if you’re looking for a few more delicious vegetables soups I have a couple more favorites to share! – Easy Potato Soup is one of my most popular recipes. Pinned over twenty-four thousand times, it is cheesy and amazing. It only takes 30 minutes to make! Another you should definitely try is Roasted Tomato Vegetable Soup mmmm! This one is so good! Have you tried either of these yet? If you would like to make the best homemade soup, be sure to visit Homemade Soup; A Complete Guide. In this free resource, I’ve compiled all of my knowledge about soup; hints, tricks and soup making tips to help you make the very best soups and stews at home! You know what I always say…. Soup is good food!! Minestrone Soup is one of those easy soups that you can put together in a snap. 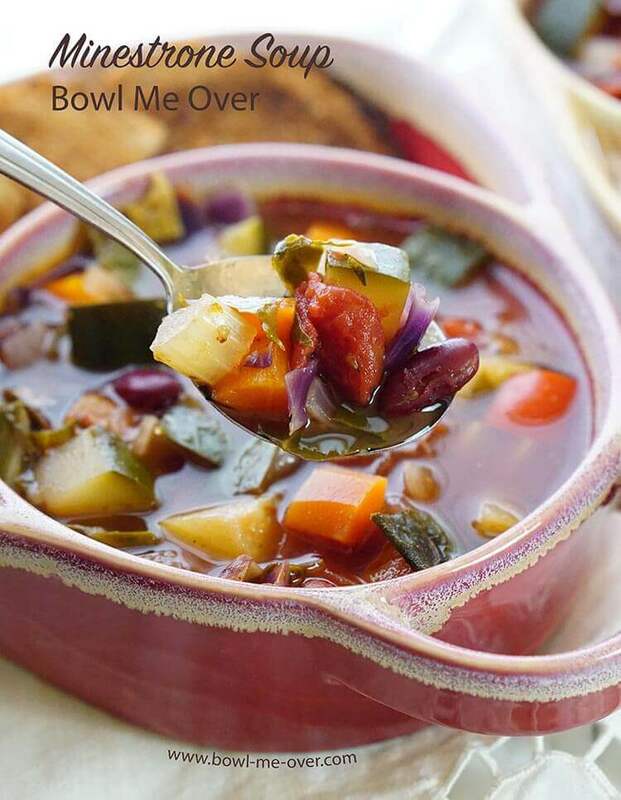 Packed full of vegetables and beans this soup has less than 200 calories for a generous two cup serving. It’s filling enough for a complete meal! In a large stock pot over medium heat add oil and sauté the zucchini, onions, peppers and garlic until they just begin to soften, about 5-7 minutes. Add the kidney beans, garlic, kale and spices - Italian seasoning, salt, pepper and red pepper flakes and continue sautéing for again for about 2 more minutes. Next add the vegetable stock, tomatoes, tomato sauce and 2 cups of water. Bring to a boil, reduce to a simmer and loosely cover. Simmer on the stove for about an hour stirring occasionally. You may need to add more water to soup - just keep an eye on it. After an hour, check and adjust seasoning - you may need a bit more salt & pepper. If you enjoy pasta in your Minestrone Soup cook it separately and add it to the soup before serving. If you cook them together, it will absorb all the sauce. Be creative and use your favorite vegetables, enjoy! If you’d like to check out some other delicious Minestrone Soup recipe here are a few that caught my eye! 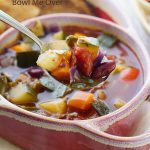 Slow Cooker Minestrone Soup from A Dash of Megnut – why not let the slow cooker do all of the work for you? How to make Minestrone Soup from Foodie Crush where she shares a family recipe with a secret ingredient! Classic Minestrone Soup from Cookie + Kate a traditional minestrone soup made with a tomato-y broth. You know it’s such a great soup to use up all of those leftover bits of veggies too, such a lovely soup! Enjoy Rini & thank you so much for the compliment!! Delish. Good clean-out-the-fridge soup ….all those yummy little odds and ends. I always feel economical AND healthy when I eat it. I totally agree Michelle! It’s one of the best outa the fridge kinda soups, love that!! This recipe looks delicious and your pictures are beautiful! I love how easy this is and perfect for any night of the week. Thank you for sharing! Luci’s Morsels | fashion. food. frivolity. Easy and delicious, nailed it Luci!! Thank you for the compliment on my picture too, love picture taking!! I hope you do Stephanie, if so swing back and let me know what you think!! Minestrone is one of my absolute favourites. Looks like yours is jam packed full of goodies! Thank you Emma, love all those yummy vegetables! Minestrone is my favorite soup when it’s cold outside or when I’m feeling crummy like I am today. Really wish I had a bowl of this today! If I was closer I’d be sending a bowl your way!! I hope you feel better soon! I love that this is easy and healthy. Looks so hearty! Very hearty for an all veggie soup, I hope you really enjoy it Brandi! Minestrone is my favorite soup to make — I love that you are putting fire roasted tomatoes in this! I will have to try that next time. Just reading your post makes me want a pot simmering on my stove! Will have to make this week. Such an easy soup with so much flavor. Thank you Michelle! It’s absolutely soup weather this week in New England and this is a perfect new recipe to try for the occasion! One order coming up Sarah! 😉 Enjoy!! Minestrone is one of my absolute favorite soups! And I agree, it is so easy to make when you can use what you have on hand. This looks absolutely delicious! Thanks Kim – always a favorite here too! This looks so hearty and inviting and the perfect healthy meal to have on a busy week night! Yum! The perfect combo Hope! 🙂 Thanks so much for stopping by! What a great recipe for a great soup classic! Noting feels as comforting during the cold weather like a warm Minestrone Soup! Soup is always good food! 😀 All those veggies are so yummy, thanks Ilka!! 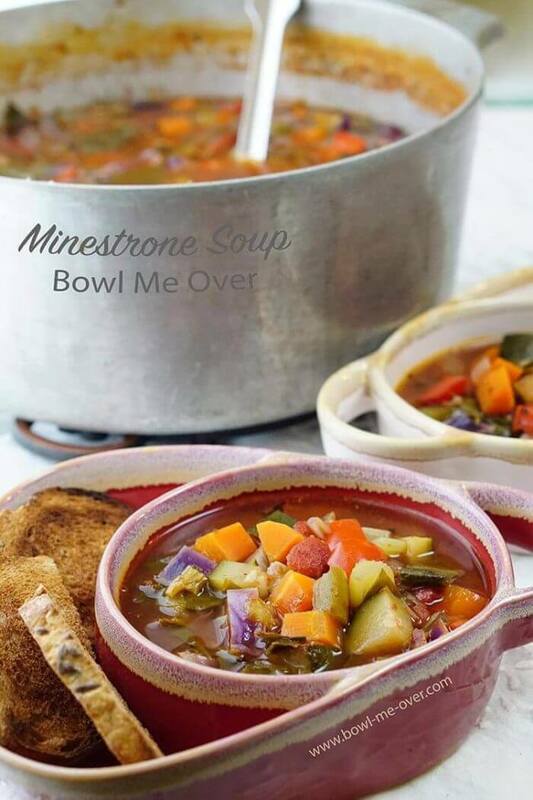 Minestrone is one of my all time favorites! Such a comfort meal for me and always makes me think of my grandparents and their rustic Italian cooking. I love it when food brings back memories! Thank you for sharing and enjoy the soup Angela!! I’m loving all of the beautiful veggies in this soup! So healthy and flavorful; going to add this to our dinner rotation! Fantastic, it’s a soup everyone loves – thanks for stopping by Ashlyn! As crazy as this sounds, I have never made a minestrone soup. Once again your beautiful work has inspired me to take care of that issue soon! Thanks for yet another beautiful recipe. No way! With all of the cooking you do that’s a big surprise! Yep, time to make a pot of soup, I hope you really enjoy minestrone! This soup looks so hearty and delicious! I can’t believe it only has 200 hundred calories! I definitely need to try this soon! Most definitely Lisa! I hope you really enjoy this guilt-free soup! I love milestrone soup but some how, I’ve never actually made it! I’ll definitely be giving this version a go!